Hubs and I recently returned from a trip up to Pennsylvania. We went to a family reunion for my father's side of the family. One of my father's cousins owns several apple orchards in both Pennsylvania and in Vermont. Her apples from the orchard in Vermont were ready while we were visiting. So of course we had to bring home a big bag of the Pink Paula (great name haha) apples. What better to do with some of my apple stash than to make an apple pie/tart of some sort. I turned to my go-to baking cookbook, Baking, From My Home to Yours by Dorie Greenspan, for some ideas. This is one of my favorite baking cookbooks. It you don't own a copy, Get. One. Now! No really, it's a cookbook every baker needs on hand. I love Dorie's Rustic Apple Tart recipe that I made here but wanted to try something different this time. This Normandy Apple Tart is a recipe I've always wanted to make but I almost never have enough apples on hand to make it. Well with a twenty pound bag of apples, that was not an issue this time! I really liked this tart. It's simple flavors really let the apples be the star.The slightly tart apples combined with the buttery crust is absolutely heavenly!! Don't let the making apple sauce step of this tart keep you from making it. It's really quite easy. You could even use a pre-made store bought apple sauce, if you wanted but I encourage you to take the time to make your own sauce. It's well worth the little extra effort it requires!! So it's been a while since I've been here. 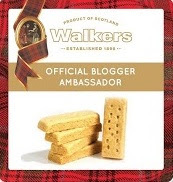 Hey I've been at this blogging thing for 7 years so I guess I was due a sabbatical. I hadn't planned to be gone so long from blogging but my cake business has been keeping me so busy that something had to give. After a long day of baking and decorating,the last things my tired fingers have felt like doing is typing! Anyway enough excuses, I'm back to share a great recipe for Swiss meringue buttercream (aka SMB) I found recently. 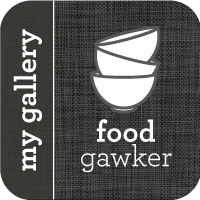 I've tired numerous SMB recipes and this one is by far the best tasting and easiest to work SMB that I've ever made. It's so light and airy it almost has the texture of a whipped cream frosting. This recipe is also great for those of us that live in high humidity areas because it's more stable than many SMB recipes I've tried in the past. I also love how smooth I could get this icing without much effort! This recipe comes from Gretchen Price at Woodland Bakery. She calls this recipe The Worlds Best Swiss Meringue Buttercream, and I think I agree! She has a step-by step video here to guide you through the process of making the SMB. Gretchen is very entertaining to watch and makes the whole process of making SMB a lot less intimidating. If you've never tried making SMB before I highly recommend watching the video and giving it a try. Click one of the links above for the complete recipe and video for the World's Best Swiss Meringue Buttercream! 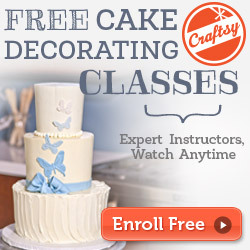 Craftsy's Creative Escape Flash Sale: Save Up to 50%! 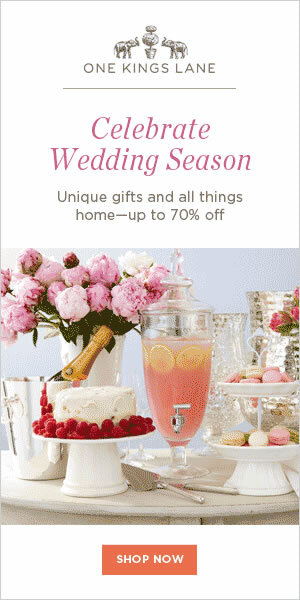 Don't miss out on Craftsy's Creative Escape Flash Sale! Save up to 50% at Craftsy's Creative Escape Flash Sale for a limited time only. You won't see so many classes with prices this low again soon. Hurry, offer expires July 20th at 11:59pm MT. Shop Craftsy's Creative Escape Flash Sale! In the past, I've shared my family's Mardi Gras traditions here on Half Baked. My Pennsylvania Dutch side of the family always makes doughnut for Fastnacht Day. A couple of years ago I changed it up a bit and made these beignets instead of our traditional doughnuts. This year I thought I'd try an Italian twist to tradition and made Pasta Ciotti which means "little custard tarts". Little pastries filled with cream....I think they are the perfect indulgence for Fat Tuesday! The original recipe has them being made in 3" tart pans but they can also be made in a muffin pan, which is what I used to make mine. The recipe may look a little intimidating but I found they were actually quite easy to make. The dough is very forgiving and fairly easy to work with. Need some inspiration for a sweet treat for that special someone in your life?? Here are a few great treats that are sure to make your sweetheart swoon! 1.Chocolate Valentino Cake The name says it all! This rich decadent flourless chocolate cake will have your sweetie falling at your feet...end you don't have to tell them how easy it is to make! 2. Strawberry Panna Cotta So pretty and delicious...the perfect end to a romantic dinner. 4.Knock-off Salted Chocolate Caramel Candies Made with store bought caramel squares, these take only a few minutes to make but will have your Valentine begging for more! 5. Pink Champagne Cake It's cake made with Champagne...what's not to love! 6. Chocolate Espresso Mousse Richly chocolate but light and fluffy. Definitely swoon inducing! Looking to surprise your Valentine with a special treat this year? I've got the perfect Valentine's Day cake. This Ruffle Heart cake is fairly easy and oh so sweet! 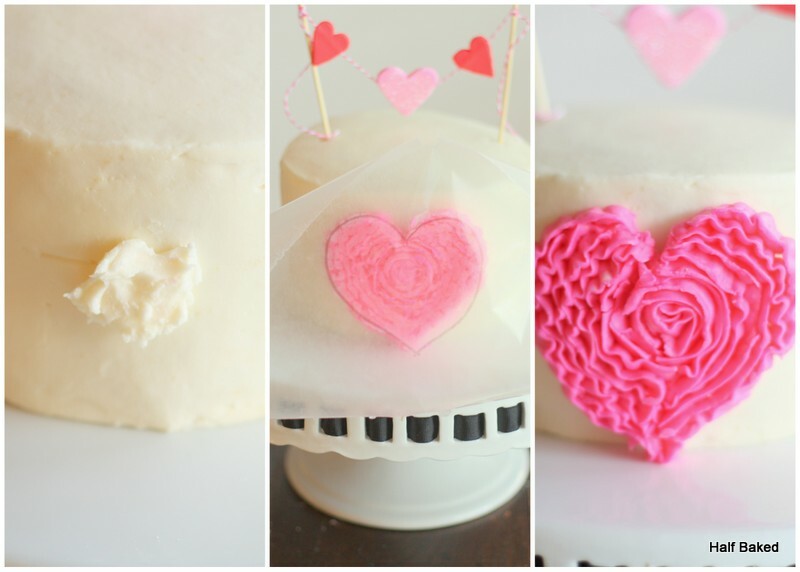 Draw a heart on the waxed with a marker that's approximately 3-inches tall for a four inch tall cake. 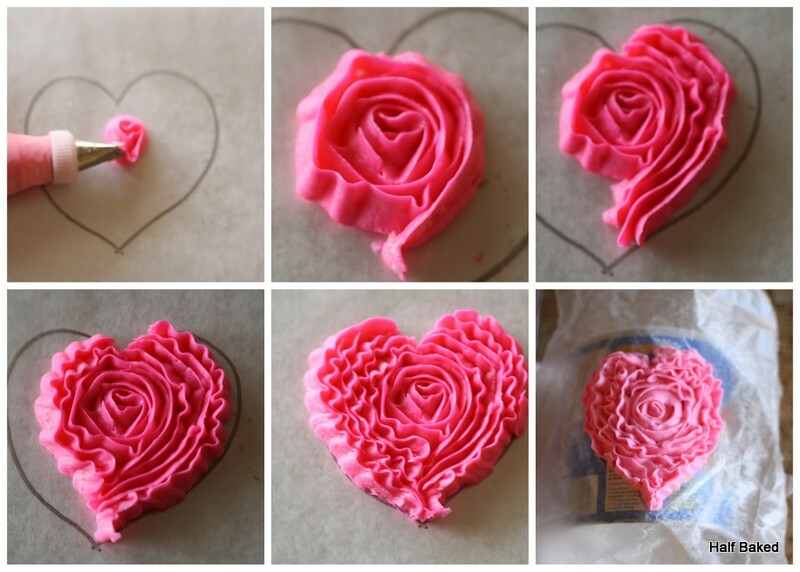 Place the frosting in the pastry bag fitted with the #104 tip, Starting in the center of the heart shape on the waxed paper with the larger end of the tip touching the waxed paper, pip a small round ruffle shape. You will need to turn the waxed paper as you pip. Use a cake turntable if you have one but it isn't necessary to use a turntable if you don't own one. Then pip ruffled rows on each side of the center to until you fill out to the outline of the heart. Make sure your rows from each side meet at the bottom. Using a rounded container that is laying on it's side, place the piped heart on the waxed paper onto round container vertically. You can use any large rounded container such as, an oatmeal or shortening container, soup cans are too small. (see photo above). The curve of the container will allow the heart to set up with a slight curve that will make it easier to adhere to the curve of the cake. Place the heart on the container into the freezer for 20-30 minutes or until completely firm to the touch. Put a dot of frosting onto the side of the cake, where you want to place the heart. Gently lift the buttercream heart from the waxed paper and place onto the side of the cake where you put the dot of frosting. I put the heart onto the cake and placed the piece of waxed paper back over it to press it onto the cake. I wanted to minimize the warmth of my hand from warming up the buttercream and crushing any of the ruffles as I pressed the heart on the cake. Roll out the pink and red fondant to about 1/4 inch thickness. Cut out 4 small hearts from the red and two medium hearts from the pink fondant. 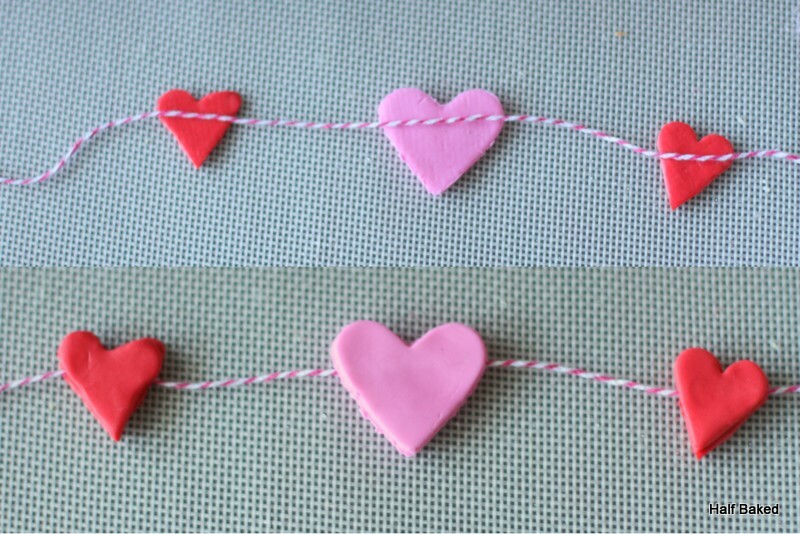 Lay one of the pink hearts with a red heart on each side, leave about two inches of space between each of the heart. Place the twine across the middle of each of the hearts. very lightly press the twine onto the heart. Place the remaining matching hearts on top of their mate. Press together the hearts, trapping the twine in between. If your hearts don't want to stick together, use a tiny drop of water on one of the hearts to help glue on the matching heart on top. Let the fondant dry for at least 24 hours. Tie the ends of the twine very tightly onto bamboo skewers to make the banner. To add a little extra sparkle,I added a bit of food safe disco dust to my center heart. Place the skewers on the banner on the top of the cake. It's almost Game Day. If your having a Super Bowl party, you'll want to put this pizza dip on the menu. Not only is it ridiculously easy to prepare, but it's also everything you love about pizza but in the form of a dip. What could be more perfect! If your having a large party just double the recipe and you're set to feed a crowd. In a food processor, combine the cream cheese, cheese, olive oil, salt and the spices. Pulse the mixture until very well combined. Shape the cheese mixture into a football or just a mound. Make a deep well on top of the cheese mixture. Put the tomato sauce in the well you made in the top. Shingle the pepperoni all around the exterior. Dig in! If you need some more inspiration for Game Day foods here is a round-up of a few of my favorites!